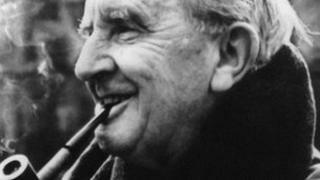 JRR Tolkien was passed over for the 1961 Nobel literature prize after the storytelling in his Lord of the Rings trilogy was described as second rate. Newly-released documents - declassified after 50 years - show that he was nominated by fellow author CS Lewis. The Nobel prize jury said "the result has not in any way measured up to storytelling of the highest quality". Yugoslav writer Ivo Andric won for the "epic force with which he has traced themes and depicted human destinies". Journalist Andreas Ekstrom, who studied the documents this week, reported his findings in Swedish newspaper Sydsvenska Dagbladet. They feature an original list of about 50 writers - put forward for the award by academics, experts and previous winners - complete with commentary from the prize jury. Notes relating to the final decision are never released. The papers also show that British writer Graham Greene - who never won the Nobel - was the jury's runner-up, followed by Karen Blixen, the Danish writer of Out of Africa. Green, who by 1961 had already written novels including Brighton Rock and Our Man in Havana, published A Burnt-Out Case - the story of a stranger who turns up in a remote leper settlement for no apparent reason - a year earlier. In the notes, jury member Anders Osterling described Greene as "a fully-fledged candidate" who should be considered for his recent work as well as his "contribution as a whole". Other prominent literary figures put forward in 1961 included Britons EM Forster, author of works including Howards End, and The Alexandria Quartet writer Lawrence Durrell. Americans John Steinbeck - who went on to win the prize a year later - and Robert Frost were also considered. Poet Frost and Forster - both in their 80s - were ruled out by the jury because of their advanced years. Mr Ekstrom told the Guardian newspaper he had been studying Nobel papers released in January for the past five years and it was the first time he had seen Tolkien's name among suggested candidates.